Place the frozen okra in a bowl. Let it sit for a few minutes, so the ice crystals start to melt. 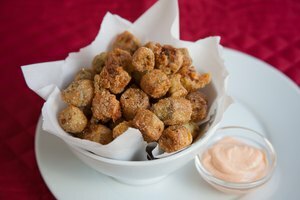 Combine one part cornmeal and one part flour, enough to coat the okra. Add the mixture to the okra and toss to coat, adding salt and pepper to taste. 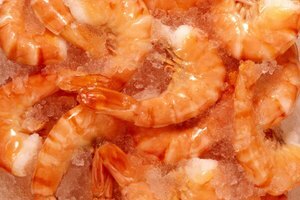 Heat about 1/4 cup of vegetable oil in the bottom of a cast iron skillet or a frying pan over medium heat. When a drop of the flour paste sizzles when added to the pan, add the coated okra. Fry the okra on one side for about five minutes, shaking the pan occasionally. Turn the okra with a wooden spoon or spatula and continue cooking until the okra is golden brown on all sides. The okra will both defrost and cook during this time. 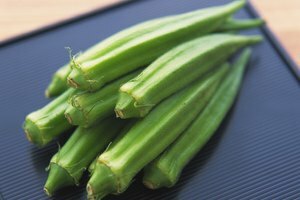 Remove the okra from the pan and place it on a paper towel-lined plate. When the excess oil has drained off, it's ready to serve. You can add other spices, such as garlic powder, chili powder or cayenne to the flour, if you like. Watch out for oil spatter when you added the frozen okra to the oil.